A few months back, my old friend Graeme Joy called me to ask if I knew anything about volunteering in Nepal, as his neighbour’s son was planning to spend time there after a trip to Iceland. Did I, or what! 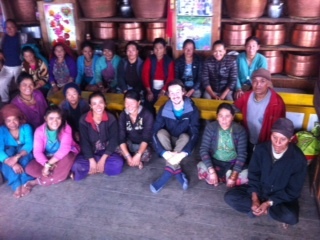 Jeremy had never been to Nepal, and wanted a grassroot experience. I am so happy I was able to help him, and my family and village in Nepal!!! It was an absolute pleasure to see this young man absolutely bloom from his time immersed in real Nepali life! I’ve just done a quick summary of my time in Lura with pictures attached. It is quite brief and some things are a little difficult to explain so if you have any question feel free to shoot me an email. I hope that this helps in understanding the current position and needs of the village! 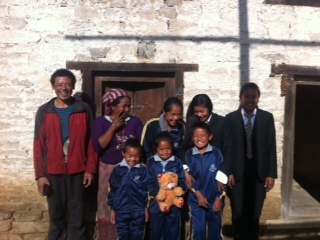 This is Lakpa’s beautiful family and his lovely home which I stayed at for 4 weeks. He has been working very hard to improve his house every year. Most recently, Lapka built a chimney in his kitchen to collect most of the smoke from his fire place. By making the chimney he has saved a lot of money on having to constantly change the wooden paneling on his roof which deteriorates from the smoke. He has also been working on his living room (pray room). His talented friend has designed and painted the piece! Future project include painting the walls of the house and building a shed for his cow. I spent most of my time at the local school. I was very lucky to get to know the lovely students and staff! 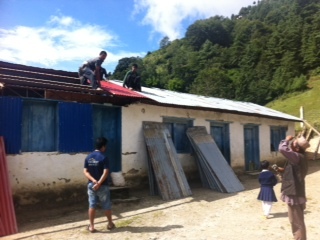 During this time we help rebuild the roof of the old school rooms. The project took 4 days to complete with Lakpa and his friends help. The school was an absolutely wonderful experience for me. There are 48 students from nursery to class 5. The kids were really fun-loving but also showed a desire to learn! 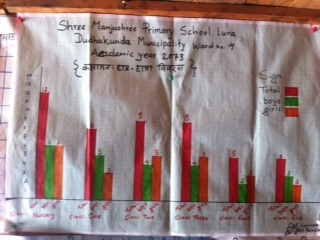 Last year, the school had 4 new rooms built – which are very good quality. 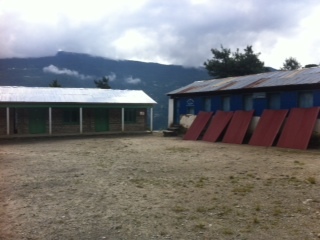 In total they have 6 classrooms, a teachers room and a teachers lounge. Every class has a whiteboard and enough tables and chairs for all the students. Lessons were based around text book activities – both theoretical and practical. I loved the school so much because the kids seemed really happy to be there. I think it serves as a great place to learn but also a safe environment away from home. 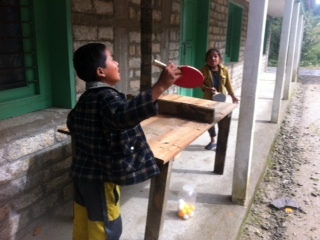 In my time there me and a few students built a table tennis table. Although it was very basic and not very flat we all had great fun playing on it! As there aren’t any organised sports in the area I’d recommend that if any further volunteers go they should try and teach some sports to the kids. I met the women’s community group once in my time at Lura. I was warmly welcomed to their meeting which happens once a month. They discussed loans, projects and problems in the village. Often they go and help out families who are struggling. It was incredible to see such a tight knit community! The group wants to learn English but are currently at a very basic level. 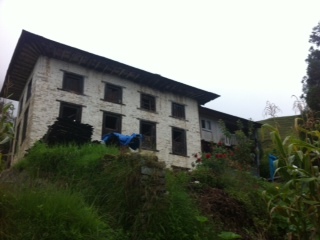 Lakpa suggested that one of his daughters could start to teach the group as early as the end of this year. They ask for some small funding for this project which I am happy to provide. Scheduling and costing are still to be arranged. 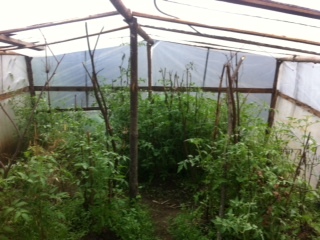 One of the other projects for the community is the greenhouses. 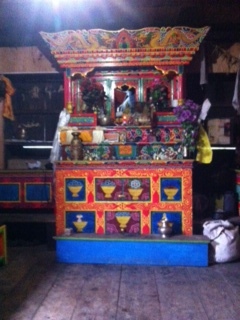 They currently have 1 which is located behind Lakpa’s home. 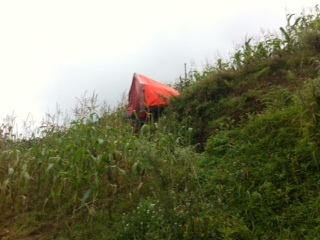 This one cost 18000RP, with 14000 donated and 4000 from locals. In the future they would like two build 1 or 2 more but this isn’t an immediate need. There aren’t many, if any, jobs in Lura. Most families live off their crops. Some sell produce at the local market while others may send one of their children overseas for work. There aren’t many jobs available in the area and if there are they are difficult to get. For example, training to become a nurse at the local hospital cost around $15000 US. More realistically, people could get jobs in hospitality. Training in cooking is needed for this. The only real ‘business’ in Lura is a chicken farm which was built only a few months ago. 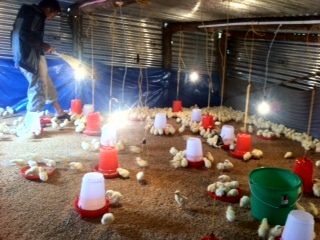 Around 4 young men run the farm which has roughly 1500 baby chickens. They plan to sell them as meat in town after they have fully grown. Lura has a few current problems/difficulties. They are still repairing damage from the earthquake. 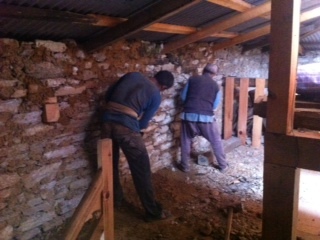 In my time there, a few young men were helping fix the attic of the monastery which had started to collapse. The other main issue for the locals is animals stealing their crops. In recent years during harvest, bears have been eating lots of people’s corn. This has grown every year and people are struggling to find a solution. Nearly every family has decided to make a tent in their corn fields which they sleep in and make loud noises when they hear bears at night. As you can see this makes living much harder. 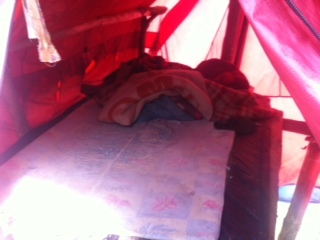 Lakpa spent nearly every night here when I was in Lura and had to wake up every hour in order to save his crops. One of the smaller issues I found was littering. The area doesn’t have a garbage service/system so most people are happy to dump rubbish outside. Although some people burn their rubbish to get rid of it, lots still litter. Also, I’m not sure how good this is environmentally. The solution to this is also a difficult one. While these problems exist, everyone in the village is happy and optimistic about the future. They are incredibly hard working people who have an great ability to just keep going. They are also very grateful for all the help they have received along the way. I found this place very very special. I think that this was because of how the community works. Everyone is always putting others first. If there is anyone needing help, the entire village will stop to make sure that they are ok. The closeness of the people is truly amazing! I know that they will continue to grow and improve the area. This was one of the most incredible experiences of my life and I am so grateful to the entire village. I would really love to stay involved with the place so if there is anything I can do please let me know. I really hope that this has helped translate some of the wants and needs of the people. Feel free to email me in order to clarify anything or for any help! Much love from Jeremy and the entire Lura community!!! A HUGE thank you Jeremy, for this report, and your contribution to the Beyond teh Smile work in Lura!! Brigitte Koch-Muir OAM summitted Everest in 1997, on her fourth attempt. Storms, spending the night out at 8500m without light or oxygen, and being caught in the 1996 disaster on the South Col of Everest are some of the challenges she faced before eventually summitting. 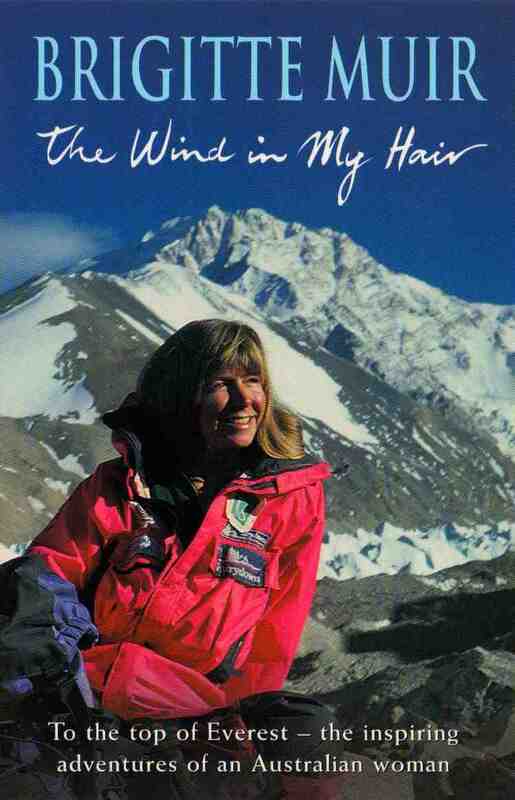 She was a high altitude expedition climber, and leader, for almost thirty years. She is now a story teller, and belongs to the Beyond the Smile Friendily, and the SEED Alliances, a network of people excited by the idea of changing the world by implementing a business model based on the seven chakras, and having fun doing it. Excellent post! I have just done a shout out in social media for future volunteers. If I receive any replies, I will send them your way. Enjoyed reading about the community and all the activities going on there. Wishing them ongoing success. Thank you for your contribution!